The Truk Islands (Chuuk Islands) are located in Truk Lagoon in Chuuk State (Truk) in the Federated States of Micronesia. Truk consist of eleven major islands and many smaller islets within a forty mile wide lagoon surrounded by a protective reef. Entrances into the lagoon including North Pass, North East Pass, Salat Pass, Wilger Pass, Otta Pass, Aualap Pass, Ulifauro Pass, Piaanu Pass, Taualap Pass. Truk Harbor (Eten Anchorage) is the inner anchorage bordering Dublon Island (Tonoas, Tonowas) to the north, Eten Island (Takeshima) to the east, Uman Island to the south and Fefan Island to the west. To the southeast is Kuop Atoll (Neoch Atoll). On November 15, 1939, the Imperial Japanese Navy (IJN) Fourth Fleet (4th Fleet) under the command of Admiral Katagiri Eikichi established their base at Truk. Chitose was assigned as flagship with tenders Kamoi and Kinugasa Maru of the 17th Sentai to support the new fleet. In December 1939 twenty-four H6K Mavis flying boats from the Yokohama Kokutai were based at Truk Lagoon. During the Pacific War, Truk Lagoon was an important anchorage and staging base. It was also used as a ferry point for aircraft flying Japan or aircraft carriers. From Truk, aircraft could proceed southward to Rabaul and onward to New Guinea or the Solomons. A total of five airfields and seaplane bases were built in Truk Lagoon. Megeson Airfield (Megeson) under construction during 1944 never completed. The area was heavily defended with anti-aircraft guns, coastal guns and later in the war defenses were bolstered with additional submarine nets placed in the water along with more mines and even rocket launchers. There were over eighty 25mm anti-aircraft guns and 12cm guns in emplacements along with many smaller guns. Later in the war, manned torpedo bases were established on the outer islands and Daihatsu landing craft were converted into torpedo boats. Other defenses included sea mines in lagoon entrances and land mines on the outer islands. On January 15, 1941 Royal Australian Air Force (RAAF) Catalina flying boats flying from Rabaul via Kavieng bombed Truk. After the Japanese occupation of Rabaul, no Allied aircraft had the range to reach Truk. Beyond the reach of Allied aircraft and heavily defended, Truk was dubbed the "Gibraltar of the Pacific". It was not until early February 1944 when the first long range reconnaissance mission reached Truk. During February 16-18, 1944 during "Operation Hailstone" U. S. Navy (USN) 500+ carrier aircraft from Task Force 58 (TF 58) under the command of Vice Admiral R. A. Spruance including USS Enterprise, USS Yorktown, USS Intrepid CV-11, USS Essex CV-9, USS Bunker Hill CV-17, USS Belleau Wood CVL-24, USS Cabot CVL-28, USS Monterey CVL-26 and USS Cowpens CVL-25 supported by seven battleships, heavy cruisers, light cruisers, destroyers and submarines. 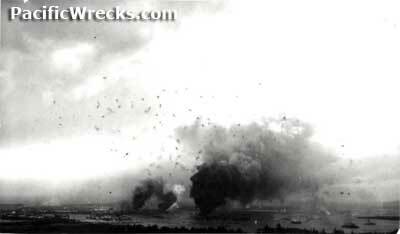 The raid began on February 16, 1944 with a fighter sweep over Truk with strikes on February 17-18, 1944. During the raids, 400 tons of bombs and torpedoes were dropped. In total, forty ships were sunk and thousands of Japanese died. Ten weeks later, a second raid sank more ships. The Allies bypassed Truk and instead bombed the anchorage and bases to neutralize them from the air. During 1944, attacked by B-24 Liberators from the 7th Air Force and later Far East Air Force (FEAF). During 1945, Truk was within range of B-25 Mitchells from the Central Pacific and escorting fighters including P-38 Lightnings and P-47 Thunderbolts and B-29 Superfortress flew bombing familiarization missions until the end of June 1945. On the ground, the Japanese garrison was cut off from resupply but continued to defend Truk until the official surrender of Japan in September 1945. Until the late 1940s, oil from the sunken ships and war debris covered the beaches and coral reefs.